You wonder where oddsmakers come up with this stuff. Usually they're not far off, but that hasn't been the case the past two weeks for Boise State. Two weeks ago my Friday headline was, “The danger of being a two-touchdown favorite.” Last Friday it was “Danger of being a double-digit favorite—the sequel.” With Boise State favored by 23½ points over Colorado State in tonight’s ESPN2 game at Albertsons Stadium, this is becoming a network series. 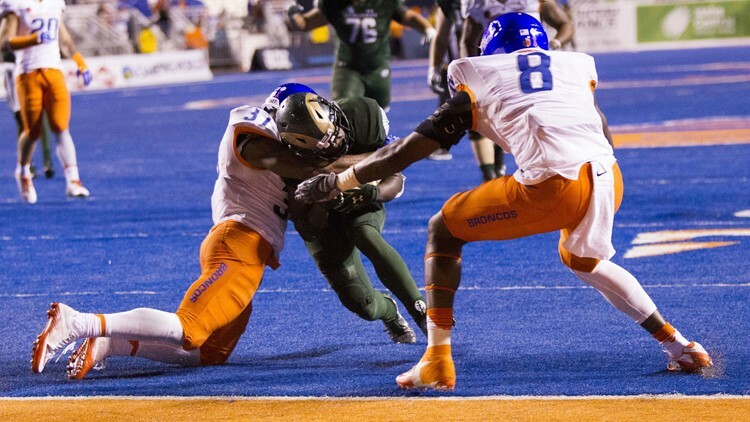 The Broncos missed the spread by 20 points in the blue turf loss to San Diego State and by 13 in the win at Nevada. Sometimes fans get a false sense of security with these things, but everybody’s been through this enough that there will be nothing taken for granted tonight. And there’s this, as you recall. Boise State’s average margin of victory over the Rams the past two years: six points. The Boise State secondary had some challenges last week with Elijah Cooks, Nevada’s 6-4 wide receiver. Cooks’ biggest play of the night was a jump-ball touchdown in the corner of the end zone. Well, the Broncos have another 6-4 wideout to deal with tonight, and this one has all the tools. Colorado State’s Preston Williams was a five-star recruit, the No. 1 wide receiver prospect in the country coming out of high school. Williams played two seasons at Tennessee before transferring to CSU and sitting out last year. He spent about 10 months in coach Mike Bono’s doghouse with a suspension, but he’s been out since the season started, and he’s been dominant. Williams has one 12-catch game and has made 52 total grabs for 671 yards and seven touchdowns. Backup quarterback has been a hot subject this week at Boise State. That hasn’t been a question at Colorado State. While Washington graduate transfer K.J. Carta-Samuels has been the Rams’ season-long starter, he could give way to Collin Hill at any time. Hill, who was CSU’s projected starter going into spring ball, underwent surgery on his ACL in March but has made a remarkably quick recovery. With the Rams offense struggling to score points this season, a column in the Coloradoan newspaper called for the keys to the offense to be handed over to Hill. He hasn’t been able to make an impact in games, though, going 13-of-34 (38 percent) for 153 yards with one touchdown and one interception. A sidebar on one of the other Mountain West games tomorrow: Utah State is favored by 15 points at Wyoming. So what? Well, bet on the Aggies. They’re one of only four teams left in the country who are unbeaten against the closing spread (the others are Washington State, Appalachian State and Florida International). The way USU is scoring points this season, and the way the Cowboys offense is avoiding them, you’ve gotta like the Aggies. Besides, the Pokes are 1-6 against the spread. They’re in the bottom 10 in the nation in yards per play at 4.6. And Wyo is outside the top 100 in third down conversions on both offense and defense. Surprising for that defense, as it was supposed to be the cream of the crop in the MW. Has Southern Utah turned the corner? The Thunderbirds’ 0-5 start was shocking when you consider they made the FCS Playoffs in two of the last three seasons. SUU will be facing a hungry Idaho squad tomorrow for homecoming in the Kibbie Dome. The T-Birds are coming off their first victory of the year, a 48-27 win over Sacramento State. This from a team that claimed the 2017 Big Sky championship. For the Vandals, Isaiah Saunders is on pace for a 1,000-yard season. The senior from Elk Grove, CA, has rushed for 563 yards and four touchdowns. Elsewhere, Idaho State has a tough assignment tomorrow, traveling to Virginia to play Liberty. The Flames, who have moved up to the FBS, took down Troy 22-16 last week and beat New Mexico 52-43 three weeks ago in Albuquerque. Is College of Idaho getting Southern Oregon at the right time tomorrow? The Raiders visit Simplot Stadium lugging a two-game losing streak that has dropped them to No. 14 in the NAIA rankings. The Coyotes almost upended SOU when it was No. 4, falling 35-28 in Ashland on September 8. The Raiders’ running game was enough to get them by that day, as they rushed for 251 yards. But Southern Oregon has averaged just 58 yards on the ground in consecutive losses to Rocky Mountain and Eastern Oregon. The Yotes’ ground game is much-improved. Guess who leads the Frontier Conference in rushing touchdowns right now. It’s C of I quarterback Darius-James Peterson, with eight. Not sure what to make if this. Chandler Hutchison did indeed make his official NBA debut for the Chicago Bulls last night in their 128-116 loss to the Philadelphia 76ers. But Hutchison, Boise State’s first-ever first-round NBA Draft pick, didn’t come in until just 2:49 remained in the game. He missed his only shot from the field, a floater, and didn’t register any other stats. One thing the Idaho Steelheads have that no other Boise minor league franchise has (or has had) is return players on a regular basis. As the Steelheads play their home opener tonight versus the Utah Grizzlies in CenturyLink Arena, a handful of guys will be skating on familiar ice. Two of them were solid contributors in the season-opening road trip last weekend. Justin Parizek, one of the ECHL’s top rookies in 2017-18, is tied for the team lead in points after a goal and two assists in the first three games, while Steve McParland put up one tally and one helper. Both players were Steelies mainstays last season, with similar production. Parizek amassed 27 goals and 60 points in 64 games—McParland totaled 31 goals and 57 points in 68 outings. In the 40th meeting between Boise State and Nevada, the Broncos rally from a 17-7 halftime deficit to roll past the Wolf Pack, 34-17. Senior quarterback Joe Southwick was injured on Boise State’s first play of the game, and the Broncos struggled early on. But backup Grant Hedrick eventually settled in and became the first Boise State QB to rush for 100 yards since Jared Zabransky in 2004. And sophomore tailback Jay Ajayi exploded for 222 yards on the ground, the fifth-best mark in school history. It was the Broncos’ 50th consecutive win in the month of October.